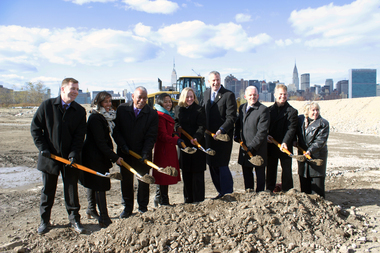 Officials broke ground on the second phase of Hunters Point South on Nov. 23, 2015. This phase will include building infrastructures, like sidewalks and roads, on a portion of formerly industrial land in order to build affordable housing. LONG ISLAND CITY — One of the three new schools planned for the neighborhood in the coming years will be built at the Hunters Point South development, according to city officials. A $60 million elementary school will be included in the second phase of construction of the mixed-use affordable housing complex, slated for a parcel of waterfront land south of 54th Avenue. It will be a standalone building located on a portion of the site bound by 57th Avenue, Center Boulevard, 56th Avenue and Second Street — streets that have not yet been constructed. The school will serve 600 students, and is expected to be completed by the end of 2020, according to the Department of Education and City Councilman Jimmy Van Bramer's office. Officials announced the new school Thursday during a meeting of the Gantry Parent Association, a neighborhood group that's been advocating for more school seats in Hunters Point. The area currently has just one elementary school, P.S./I.S. 78, where the DOE was forced to add additional pre-k and kindergarten classes last year to accommodate dozens of local students who were initially waitlisted there. Parents have petitioned the city to build more schools in the neighborhood to keep up with its growth, as more apartments continue to be constructed in the area. The Hunters Point South project alone will create thousands of additional units in the coming years. "We know more families are going to be moving in here," said Gantry Parent Association secretary Meghan Cirrito, who said the new school offers some relief to parents. "It was really wonderful to get concrete news like that," she said. In addition to the school planned at Hunters Point South, Mayor Bill de Blasio's preliminary budget — announced last month — includes funding for two other new schools in the Long Island City area. Details on where or when they'll be built have yet to be announced.